Brown and Rihanna were supposed to perform at the 2009 Grammys, but that changed after Brown attacked the pop singer. Chris Brown will perform at this year's Grammy Awards, the event where his career almost ended three years ago. Brown admitted to assaulting then-girlfriend Rihanna at a pre-Grammy party in 2009 and is serving five years of probation for the felony attack. 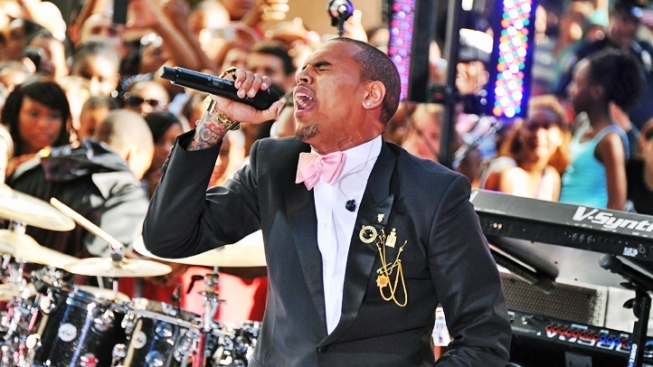 A source told The Associated Press on Monday that Brown will hit the stage at Sunday's show. The source spoke on condition of anonymity because Brown's performance has not been officially announced. After the attack, Brown's reputation plummeted, but he has since bounced back, releasing multiple mixtapes and the multi-hit album, "F.A.M.E. (Forgiving All My Enemies)." The CD is nominated for three Grammys, including best R&B album. Rihanna also will perform at the show. She's nominated for four awards, including the top prize — album of the year — for her platinum effort "Loud." Brown and Rihanna were supposed to perform at the 2009 Grammys, but that changed after Brown attacked the pop singer in the early morning hours before the awards show. Since then, Brown has not attended the Grammys, although he was nominated for three awards last year. A judge eased a restraining order last February after an attorney for Rihanna said she didn't object to removing the stay-away provisions. The former order required Brown to stay 50 yards away from 23-year-old Rihanna, but the restriction was reduced to 10 yards if they were at a music industry event. Brown, 22, has been nominated for Grammys in five of the last six years, though he has never picked up the top prize in music. His song "Look at Me Now," which features Lil Wayne and Busta Rhymes, is nominated for best rap song and best rap performance. Rihanna is the owner of four Grammys, three with Jay-Z. She alone won a Grammy last year for her No. 1 smash, "Only Girl (In the World)" for best dance recording. In addition to album of the year, her fifth CD "Loud" is up for best pop vocal album. Rihanna is also nominated twice for best rap/sung collaboration for another No.1 jam — the Drake-assisted "What's My Name?" — and for her guest appearance on Kanye West's "All of the Lights."